According to People, Dancing With The Stars will officially be back for a Fall Season. Here is a take from the link where ABC Entertainment president, Karey Burke, mentions it at the Television Critics Association Winter Press Tour on Tuesday…. During the Television Critics Association Winter Press Tour on Tuesday, ABC Entertainment president Karey Burke announced that the reality dance competition series will be returning for season 28. “I can confirm that it will definitely be returning in the fall,” Burke told reporters. Although DWTS has occasionally aired two seasons annually — spring and fall — PEOPLE confirmed in December that the long-running ABC show would be taking a hiatus and skipping a spring cycle like 2018’s Athletes mini-season. That’s not all, according to Burke via TV Line, Dancing With The Stars could be back for a Spring season afterwards. Read on…. Be sure to read the links for more. It’s going to be interesting to see how this all plays out. The ratings for the Fall season will probably determine it’s future. Let us know what you think in comments. Along with Tristan MacManus and Craig Revel Horwood!! Good for her filling her off season wisely. 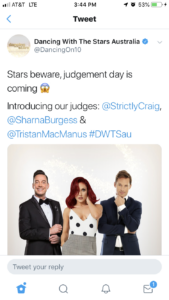 🙂 We already know one of the possible contestants she could be judging!